Good dental health is important for overall wellness. Dr. Stanley Armstrong in Windham has been helping people have their best smile since 1981. 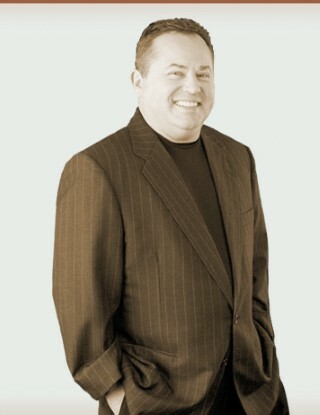 Constantly improving himself to be better and offer more services for his patients, Armstrong is accredited by the American Academy of Cosmetic Dentistry (AACD), of which he is the only one in the state, the American Facial Astetics (AFA), Botox and fillers training, and the Academy of General Dentistry. He is also certified by Pacific Training Institute of Facial Aesthetics (PTIFA) to complete smile makeovers. 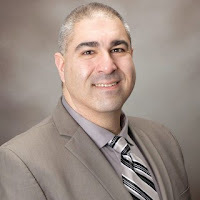 He has studied and taught at some of the best dental schools like the Las Vegas Institute for post-dentistry training, Tufts University, New York University College and he has taught at NYU, Baylor and University of Kentucky. “Our goal is making people healthy. If a patient is happy with their smile it will change their lives in many ways,” said Armstrong. He opened the doors to the current practice at the corner of Route 302 and Route 35, in October 1985. In 1998, he began doing same day crowns in his in house lab. With the lab, repairs and restorations can be done in one day. Armstrong Dental has a 3D x-ray/CT scanner that can look at things in different perspectives to catch issues early, especially when placing implants or to finding bone defects. Dr. Armstrong believes that gum health is a big issue and if not taken care of can lead to other complications like heart attacks. “You need to realize how important the oral cavity is. A person can be compromised,” Armstrong said. Whether it’s a hip or knee replacement or transplant, doctors are requiring dentists to okay the surgery. With a staff of 12, consisting of four hygienists, two assistants, three front desk staff, a clinical coordinator and CFO, the practice is full of committed employees who have been at the office for an average of 15 to 20 years. For those who are nervous about visiting the dentist, Armstrong offers nitrous oxide and conscious sedation to help relax the patients. Dr. Armstrong is known to be “painless” when it comes to injections, according to Mooradian. “He’s a perfectionist when it comes to veneers and he does implants also,” she added. 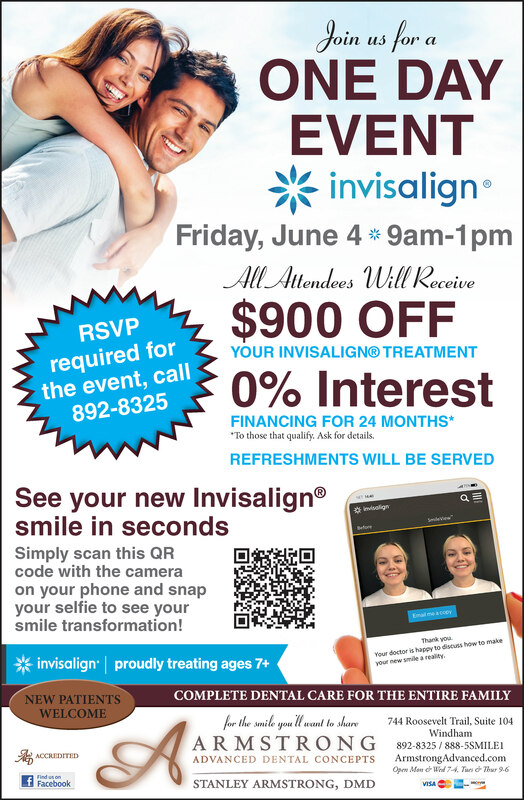 The office also offers Invisalign for teeth straightening. The air in the office is surgically clean air and the water is filtered and sterilized water after it comes in from the public water system. Armstrong Dental is a member of the Sebago Lakes Region Chamber of Commerce and it contributes to the community through various programs, like neighbors helping neighbors, yearbook, hosting a little league team and helping with fundraisers. Dr. Armstrong also gifts battered women smiles from start to finish. Education is important for a dentist, however just as important are the relationships he forms with his patients. The lifetime relationships Dr. Armstrong has formed have allowed him to watch his patients raise children and then to treat their children’s children. He is accepting patients from toddlers to seniors. There is a kids’ room and prizes for good check ups. Everyone leaves with a goodie bag, Mooradian said. Armstrong Dental sells mints made with Xylitol, electric toothbrushes and other items to keep mouths clean and healthy in a safe and cost effective way. “Teeth are what we do, but taking care of people is what we’re about. We find a way to fix them,” said Armstrong. The practice provides 24/7 concierge to make sure that patients can reach them every day. The office staff files with any insurance company electronically. “We are a fee for service practice. We don’t allow insurance to dictate what we do,” said Mooradian. Armstrong Dental also offers 24 month interest free financing. Hours are Mondays and Wednesdays 7 a.m. to 2 p.m. and Tuesdays and Thursdays are from 11 a.m. to 6 p.m.
For more information or to set up an appointment, visit www.ArmstrongAdvanced.com, call 207-892-8325, email customerservice@ArmstrongAdvanced.com or find them on Facebook. 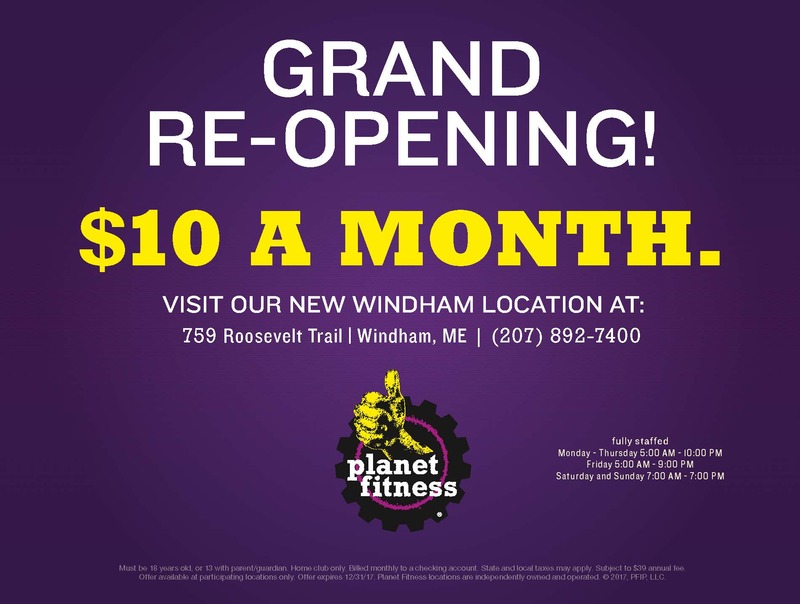 Last week, Planet Fitness in Windham relocated to a new space at 759 Roosevelt Trail, near the Windham Post Office. After 10 years in the rented location, owner Eric Giguere decided it was time to make some changes. The new location has new equipment, more space and a great new layout. 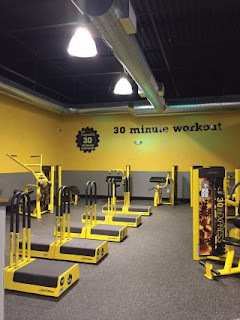 There’s an area for the 30-minute circuit workout, a stretching area away from the cardio machines and a dedicated Black Card Spa with a TV area, two tanning rooms, two kneading massage chairs and hydro massage lounge chairs. The 30-minute circuit is a full body workout that has cardio and strength training with 20 pieces of equipment that can be done in 30 minutes. The main room of the gym has 55 pieces of cardio equipment, including bikes, treadmills, arcs, stair climbers and recumbent bikes. At the beginning of the year there might be a slight wait for cardio use, but most of the time that is not an issue because there’s a piece of equipment for everyone. New this month is the Syngy 360 which includes kettle bells, ropes, a TRX, medicine balls and more, all in one area. If these exercises seem overwhelming, not to fear, Planet Fitness has a personal trainer on staff and his services are free. Monday through Friday the trainer, Cody, is available for consultations for a whole workout or just to answer questions about a particular machine. It’s PE@PF. He will sit down with members, talk over medical history and goals, then he’ll set up a program for them, Giguere said. Memberships start at $10 per month and can be canceled at any time, but for those who want to take advantage of the Black Card Spa, the price is $21.99 per month and comes with a cancellation fee. However, the benefits of the Black Card go beyond the spa. Each Black Card member is allowed to bring one guest each time they workout. They also can jump from Planet Fitness location to location and drinks are half price. “We have our five times a week guys, but we cater to everyone,” said Giguere. A 92-year-old woman told him she goes to the gym because, “This keeps me going,” she said. “We try to create that environment of community,” Giguere added. “You see people you know. It’s a gathering spot. It’s healthy living.” From 92-year-olds to high school kids to the first time gym user, all are welcome at Planet Fitness. “We break down the traditional barriers to gym memberships. We provide free training and give them a program. We do not want to make people feel uncomfortable,” said Giguere. The staff at the front desk know most people by name and greet them when they enter. The new location on Route 302 is lit up at night showing off the bold yellow and purple colors and the “No Critics” sign on the back wall. 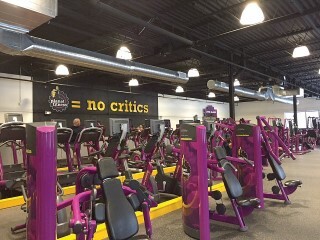 “I think this is what a Planet Fitness is supposed to look like,” said staff member Spencer Hodge. The club is open from 5 a.m. to 10 p.m. Monday through Thursday, Fridays from 5 a.m. to 9 p.m. and 7 a.m. to 7 p.m. on the weekends. Stop by for a free tour or for more information, visit www.planetfitness.com and pick a location. Finding a dental practice to trust is a big deal. 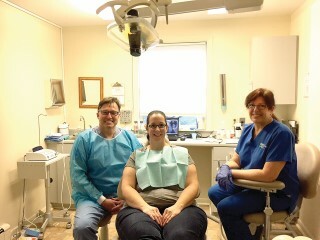 At Lifetime Dental Health they have the dental team to make any smile camera ready. From regular cleanings to extensive teeth-in-a-day services, Lifetime Dental can help keep mouths healthy and smiles bright. Dr. Kevin Guze, DMD, DMSc owns the Windham practice and the parent company, Workwell, which has six offices around Maine and Massachusetts. As a graduate of Harvard in oral biology, he also completed a post-doctoral fellowship in periodontology, which is the treatment of diseases of the gums and other periodontal tissues. He performs gum related surgeries and treatments. Dr. Guze has been in Maine for 3 years and still teaches and does research at Harvard. “My specialty is teeth-in-a-day services, placing implants and providing immediate teeth replacement in one day,” Guze said. “As a group we offer across the board dental services, including extractions, root canals, bridges and dentures.” Each doctor excels in their own way, so they work as a team to give the best treatment possible. “You can only be as good at so many things. We make sure [the doctors] are highly trained before we offer it to our patients,” said Guze. Lifetime Dental has two general dentists, a periodontist, four hygienists, three dental assistants, two front office staff members and one manager. The dentists are Donald Warner DMD, James Shahinian DMD, and Katerina Chernyjhivska DMD. The practice manager is Linda Mandarelli. “To sum up who we are . . . we have a deep understanding of care in what it takes for what we are doing when treating our patients,” Guze said. The philosophy of the practice is to approach things from a clinical and academic perspective. However, their first priority is the quality of care they offer patients, including making sure the patients are comfortable and the “the experience is as positive as it can possibly be,” Guze said. Soon the practice will be offering IV sedation and general anesthesia with a licensed anesthesiologist. “I hate causing pain. I want this to be a comfortable setting,” Guze said. The most common services provided are restorative in nature, like crowns and bridges, root canal treatments and implants. Patients from the community don’t have to leave Windham to get top quality treatment for their dental problems. Dr. Ernie Gailunis provides comprehensive crown and bridge treatments for more advanced cases. He comes to the office once a month for root canal treatments also. He has worked with Guze for four years in Massachusetts and Maine. Oral health has been closely tied to general health. It is believed that people with a healthy mouth and smile feel better about themselves. “Decades of research have demonstrated the relationship between gum and periodontal disease and high blood pressure, stroke and diabetes,” said Guze. The American Heart Association also wants patients to have a healthy mouth before having major surgeries or transplants, he added. “The quality is great. The doctors are very thorough, efficient and genuine,” said dental assistant Jennifer Cerino. The company believes in a trickle-down effect, meaning that if the employees are happy, then the patients will be happy, said district manager Susan Giaimo. “It’s bigger than just dentistry. We’ll figure out how to raise money [for the community] as a team,” Giaimo said. Patients of all ages come to Lifetime Dental. The first time a child should see a dentist is six months after the first teeth arrive, just to have the dentist take a look and as an introduction to the dentist, Guze said. The practice offers cosmetic type procedures like veneers, teeth whitening and Invisalign for straightening. They also offer Botox for TMJ related conditions. “As we grow, we’ll bring more to the community,” said Giaimo. Lifetime Dental accepts all insurance companies and participates with many. They offer a senior discount and interest free financing is also available. They have competitive prices. “We are inexpensive, cost effective and affordable,” said Mandarelli. Lifetime Dental is open Monday through Thursday and offers evening appointments on Tuesdays until 7 p.m. All other days they are open from 8 a.m. to 5 p.m., but have 24 hour emergency coverage for existing patients. 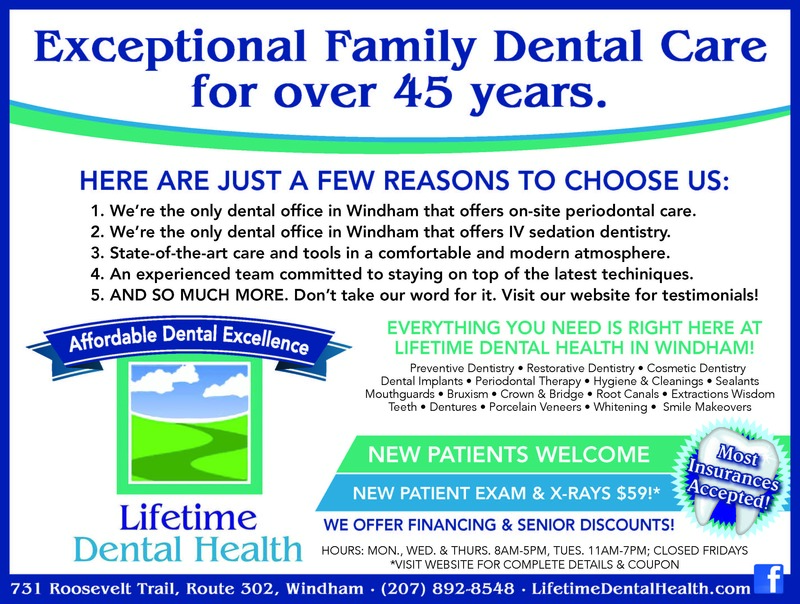 For more information on services or to schedule an appointment, visit www.lifetimedentalhealth.com, email windhamdentalPC@gmail.com or call 207-892-8548. Also, visit them on Facebook. 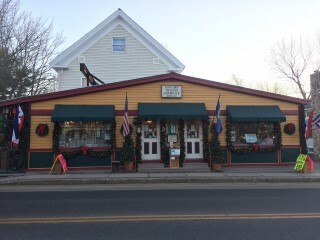 local mom and pop store that has made itself a place for unique gifts, useful items and some of the best fudge around. Owned by couple Pam Stock and Mark Grenda, the Corn Shop Trading Company is in its 18th year. There is no shortage of things to look at in the deceptively large store. Whether pottery engraved with the name of a favorite lake is what one wants or perhaps stocking stuffers to help Santa, there is something for everyone. “We try to do as local as we can,” said Pam. Items in the store are from local artisans from the area, then they carry items from Maine, then products from New England and a few from around the world. They try to keep items from local artisans stocked. The Corn Shop is a popular place for tourists and those in the area. The Corn Shop got its name from the Corn Shop Brook that runs behind the store. The location use to be a cannery for produce grown by locals. When Mark decided to open the store, he couldn’t think of a better suited name. Pam, a retired special education teacher, started working in the store full time only recently. “There’s a feeling to this store. There’s a positive, happy feeling,” Pam has been told repeatedly. When the health food store shut down, Corn Shop started selling the most popular products like Dr. Bronner’s Soaps and local honey and syrup to meet the demand of citizens in town. The Corn Shop carries a large selection of Willow Tree figures, shot glasses, Northwoods Naturals, mugs, pottery, socks, T-shirts, and the list goes on and on. Products are sorted into sections like nautical, pets, art, the popular Christmas section, and kitchen; 14 sections total. There is a selection of Native American jewelry, art and spices for smudging. When shopping, Mark suggests three trips around the store. Once looking up, once looking in the middle and once looking low. It is impossible to take everything in with one circuit. Most people don’t leave without buying some of the famous fudge. Mark has been making fudge in the store for the last eight years. Although the base fudge comes from Calico Cottage Fudge, the flavors Mark makes are his own recipes. He worked on the pumpkin fudge for five years to get it right. It tastes like a pumpkin whoopie pie. He makes blueberry, eggnog, coffee and maple syrup depending on the month. “We’re better than everyone else,” said Mark. “We ship fudge all over the world.” They have a fudge of the month club that entitles the customer to sign up for all or a selection of months to have a one pound package of fudge show up on their doorstep in the middle of the month. This is perfect to send to family out of state or someone who summers in the area. Short on gifts? 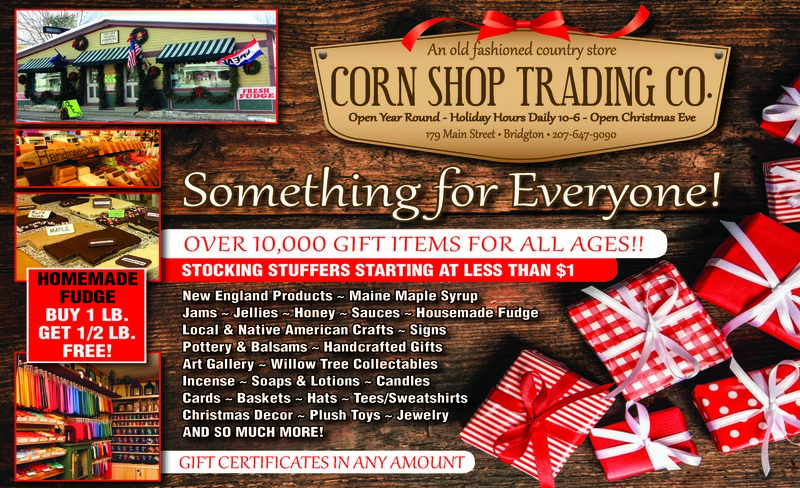 Corn Shop Trading Company can provide those unique gifts that can’t be found anywhere else. Beer soap? Incense? Personalized soap with pictures of Bridgton? Post cards to send home? They have all of this and more. Signs naming the lakes and towns in the region are in the store, and they can also be customized for no additional charge. The kitchen section is extensive with linens, woven coasters, placemats and rugs. They also have an antique section with cast iron products and other not-to-be-missed items. They have bird houses made in Bridgton, ski signs, pottery from South Paris, items from the Progress Center in Norway and bells from the New England Bell Company. “They’re really special bells,” Pam said. They carry a New Hampshire sticker line and Maine books. Corn Shop Trading Company is open seven days a week throughout most of the year. After January 1, they will be open Fridays, Saturdays, Sundays and school vacation weeks. The Corn Shop is low tech, preferring people to come into the store or call them. They can’t be found on Facebook and they don’t have a website. They are open from 10 a.m. to 6 p.m. for the holiday season and normally they are open from 10 a.m. to 5 p.m. with summer hours extended from 9 a.m. to 6 p.m.
Don’t pass up a chance to stop in, it’s worth the trip. Spectrum is already a household name as the region’s leading provider of cutting-edge TV, Internet and Voice services. For those looking for a new challenge, Spectrum is also a great place to start a new career. 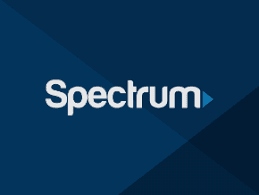 Spectrum is the suite of advanced broadband services offered by Stamford, Conn.-based Charter Communications, Inc. With over 92,000 employees serving 26 million customers in 41 states, Spectrum is America’s fastest-growing TV, internet and voice company. Nationally, Spectrum is adding 20,000 jobs by returning call center jobs to the United States, insourcing its workforce and growing to meet customer demand for its products and services. Spectrum is a Fortune 100 company and was voted on of Forbes 112 Best Places to Work. Here in Maine, Spectrum employs over 800 people and is adding 120 full-time jobs at its Portland call center on Washington Avenue. The hiring spree will nearly double the number of customer-service representatives at the center. For job seekers committed to providing customers with the best service possible, Spectrum has a lot to offer. The company offers competitive starting pay, comprehensive training and a generous benefits and vacation/time off package. Benefits include medical, dental, vision, 401(k) with a company match, tuition reimbursement up to $5,250 annually, and free/discounted Spectrum TV, Internet and Voice services. The Portland Call Center handles billing inquiries from customers in multiple states. Customer-service agents set achievable, performance-based goals every month, which helps to determine career progression, raises and more. Starting customer-service agents receive 200 hours of training, including role-playing and listening to live calls. Call center supervisors are invested in their team members’ growth and success, and meet regularly with each agent to discuss what is going well and what tools they need to be successful. Top performers and employee goals are highlighted on TV sets at the entrance to the building. There is a team culture at the call center, Devereaux said. Each agent has their own cubicle that they can decorate it however they wish. New people are welcomed and their team genuinely wants to know about them. Everyone works hard as they take care of customers from Presque Isle to Kansas City. So what is Spectrum looking for in job applicants? The best customer-service agents are people who are serious about a career, who are kind, compassionate and empathetic – and dedicated to helping customers. Prior customer-service experience is not necessary, but it doesn’t hurt, either. To be considered, applicants must be eligible to work in the United States, be at least 18 years old, and possess great communication and computer skills. Applicants can apply online and will need to pass a 57-minute assessment, along with a pre-employment drug screen and background check, to be considered for full-time employment. A Spectrum recruiter will also conduct a phone interview to make sure that Spectrum is a great fit for both parties. In Portland, Spectrum is currently hiring for the 12:30 p.m. to 9 p.m. full-time shift at the call center. The pay is $14 per hour with a 75-cent shift differential. The company is also hiring for a number of open positions across Maine, including field technicians. 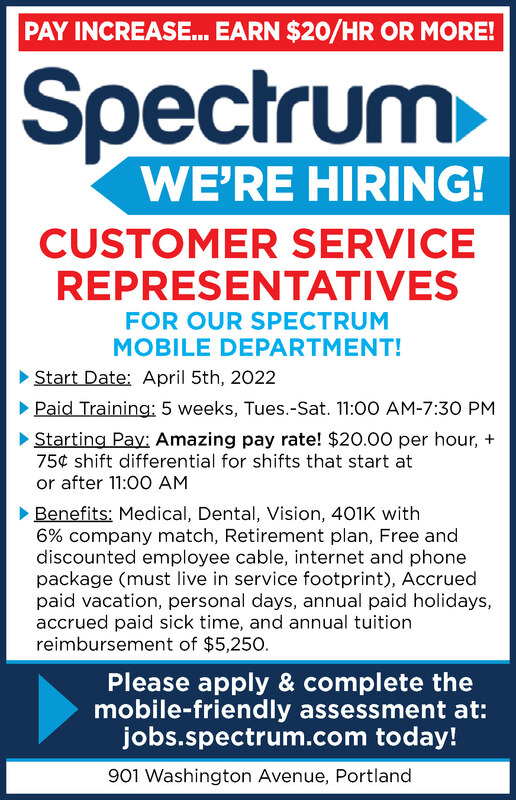 For more information, email Heather.Devereaux@Charter.com, or to apply visit, jobs.spectrum.com. Den of Antiquities at 1399 Bridgton Road in Westbrook, just over the Windham line. 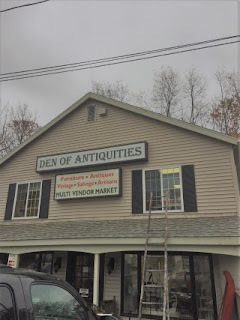 They have been acquiring and selling antique pieces from furniture to cookie cutters for many years before opening the Den of Antiquities three years ago. “We’re history buffs. We just love doing this,” said Nielsen. decision was made, opening their current shop happened in two weeks. Den of Antiquities has 11 vendors on two floors, who offer antique and vintage everything, said Nielsen. “We sell re-new products, artisan pieces or redone vintage furniture.” The higher end, home décor or homemade artisan goods are priced appropriately and some people are surprised by the deals they find. “We are very particular. We like diversity,” Nielson said about looking for certain items for the shop. “We are a very clean and organized shop, not a junk shop,” said Gammon. The types of items people look for change all the time. Right now, art deco isn’t as popular, but the farmhouse look is in, as is anything primitive or rustic. This week they have metal stars from the Bates Mill in Lewiston. One of the most unique items in the store is a casket trimming table that comes with a swinging basket that was used to keep the tools in regardless of how the table was tilted. Most of what Nielsen and Gammon do is educate the public on the antique pieces. Sometimes they are the ones being educated when older adults come in to reminisce about items they used or had in their homes. One couple, both 98 years old, came in and walked around for hours, then offered Nielsen $5 for the entertainment. They always have staple items like jugs, crocks and glassware. They also have older books. Homemade soaps are displayed in a dental cabinet which is a piece of dental history that is for sale. “Things change in here daily. There’s a huge turn over. I sell one piece, I rearrange ten,” Nielsen said. Regulars are always stopping by to see how the store has changed. All ages come by the shop from little kids who like to look at the ceramic figures or the little girls who try on the vintage costume jewelry while their adult looks around the store. “I love the people. They come in and tell a story,” Nielsen said. 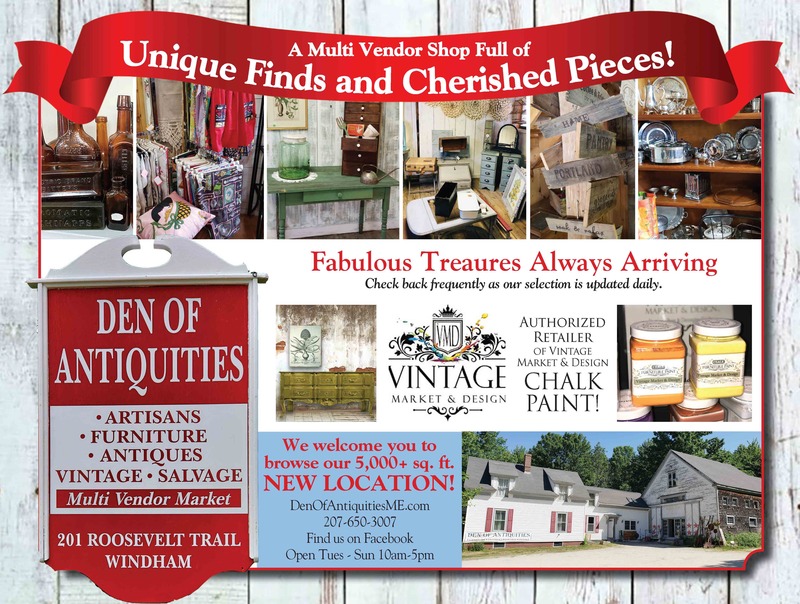 Den of Antiquities also sells Vintage Market & Design Chalk paint. The paint has been a huge seller. Nielsen helps people with their projects and she has begun taking on commissioned pieces. There is a huge variety in colors which can make the antiques unique and give them a pop of color. Nielsen is a second-generation antique dealer. Her mother repaired historic items at the Smithsonian. Nielsen never thought she wanted to work with antiques, but after refinishing the couple’s historic home, they started selling again. “We are always looking for good condition, period pieces,” Nielsen said. People stop by daily or call with one piece or a whole estate. Nielsen and Gammon like to have people do this as long as the item is clean and in good condition. They also have a flea market space in Oxford, Under Cover Flea Market, with their partner Ken Hall, where other items can be brought for purchase. Starting Black Friday through January 1, Den of Antiquities is offering 20 percent off everything in the store, except certain marked items. They ship and freight pieces all over the world at cost. From a small item to a large piece of furniture, they will package it and get it to its new home. They also sell gift certificates. Den of Antiquities is open from 10 a.m. to 5 p.m. Tuesday through Sunday, year-round. Visit them at www.denofantiquitiesme.com and find them on Facebook. For more information you can also call Nielsen at 207-650-2729 or Jim at 207-650-3007. When a loved one dies the most dreaded thing to do is find a way to honor their life without adding more grief or breaking the bank. Making the funeral arrangements is time consuming and many times filled with salespersons trying to upgrade Aunt Suzie to the Cadillac of resting spots. There is another way to honor loved ones in a respectful way that gives the family the control to execute the wishes of the one who has passed. There is a move away from traditional funeral homes with people choosing to have the body cremated so they can scatter ashes in a favorite location, display in an urn or put the ashes in jewelry. 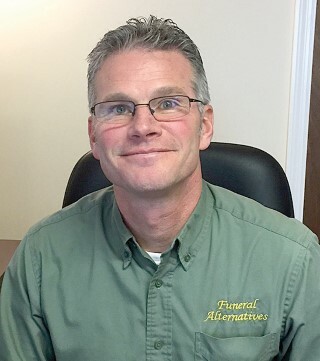 Funeral Alternatives, a full-service company with locations in five towns including Windham, offer basic services including cremation and a temporary urn as well as removal of remains from place of death, state permits, filing of certificates and forms and more. Owner and director Chuck Kincer started the company in 2002, after his work in the Navy as an aircrewman and after leaving his job as a UPS manager. “What I liked about the profession is you wear many hats, you mow lawns, meet with families that are grieving, mix chemicals for embalming,” Kincer said. Kincer owns a traditional funeral home in Richmond, in addition to the five Funeral Alternatives locations in Augusta, Lewiston, Yarmouth and Brunswick. Kincer acknowledges that his company is niche specific. People come to him because they are looking for a certain way to honor the family member or friend. “We are an alternative to a traditional funeral home, devoid of limousines and flower cars,” he said. “We offer simplicity and affordability.” The Windham location is a small office at 110 Tandberg Trail. The bright, friendly location has a display of holders to match the personality of the deceased. Some of the products are made in Maine. The simple locations have less overhead, which means the Funeral Alternatives can pass that savings on to consumers. They never push selling families anything. A lot of families appreciate that, Kincer said. “It allows us to be in support and be involved in the community without a large investment,” Kincer said. The funeral directors live in the communities they work in. Brian K. Paradis is the director in Windham, but any of the directors could help a customer. Paradis worked in a funeral home for 18 years in the community. The other directors are Steve Nadeau, Katelyn Syphers and Jon Cain. “You’ve got to be really dedicated to be in it. You have to know your clientele,” Kincer said. Cremation is becoming a more popular option for families who are choosing to do special things with the ashes. Cremation offers time, Kincer said. For those who want to scatter ashes or make jewelry, this gives them time to get the plans in place. There is no rush to do a funeral, either. “We try to make the experience about that person,” he said. Kincer also owns sister company Cotton Crematory in Richmond. “We keep the family’s loved one in our care throughout the process,” he said. Other places might have to use a third party to meet the wishes of their clients. Funeral Alternatives has a goal to respond to all calls of passing within one hour of the initial call. “I tell people to call me when you’re ready,” Kincer said. There is a 48-hour hold time from the time of death, and the medical examiner has to approve all deaths before cremation. The most affordable option at Funeral Alternatives is $1,425. The price can rise to $6,000 for a traditional burial. Some funeral homes charge up to $10,000 for a full service because of their overhead. Funeral Alternatives offers pre-payment plans with all arrangements done in Windham with a guarantee that the plan will be honored into the future without prices increasing. 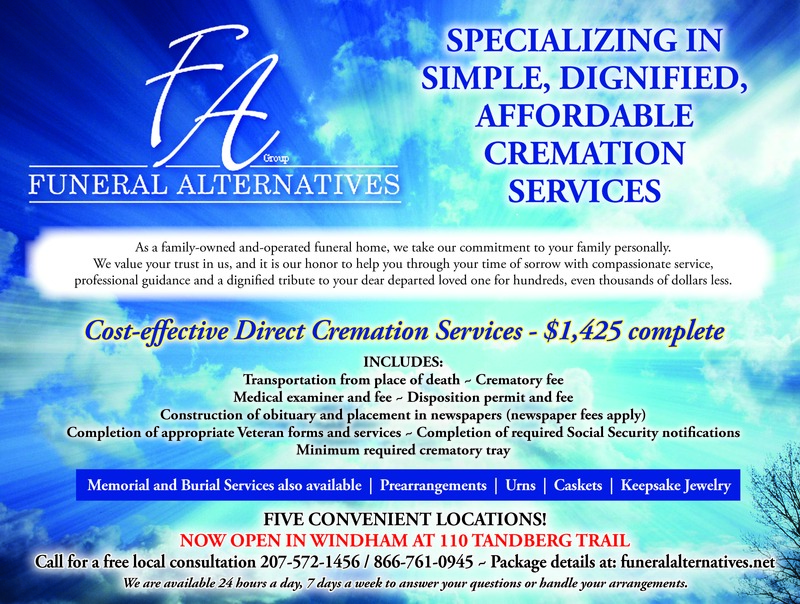 Funeral Alternatives directors are available all the time at 207-572-1456 or call toll-free at 1-866-761-0945. To meet with someone in the office, it’s best to have an appointment. In 2003, Linda and Walt Manchester created a market where people can go to get unique and interesting things. Today, the market at 1297 Roosevelt Trail in Raymond, has grown and evolved to meet the needs and desires of the clientele they serve. From the hundreds of sandwiches they make each day to the unique craft beers and fresh produce, The Good Life Market has become a staple in the Raymond community. One of the first items they chose to serve was a selection of Boar’s Head Meat. “It’s been successful. People travel to us to purchase that,” Linda said. The best meat makes the sandwiches the best they can be, she added. Linda is always looking to be unique and create new sandwiches with bold flavors. Many of the sandwiches are allergy and sensitivity friendly, with foods that are low carb, low fat or gluten free. “It changes all the time and we have to stay on the cutting edge of the what people are looking for,” Linda added. The Manchesters pride themselves on providing local products like Caldwell Farm poultry and Stonewall Kitchen products. They stock a robust cheese selection and unique snack foods. Linda travels to food shows to find new items and new recipes and she creates her own rendition of the things she tries. The most popular sandwich is The Good Life Club, a double decker sandwich filled with turkey and ham, Swiss cheese, bacon, lettuce, tomato and garlic mayo on toasted sourdough bread. “I’m inspired by what I see out in the world,” Linda said. Some recipes are personal favorites from when she and Walt were first married. Many times, the name of the sandwich will pop into her head before the recipe is developed. She encourages people to have fun when cooking and eating food. Coffee is a popular item and The Good Life Market stocks its own roasted coffee under the name Swift River Coffee, from seasonal specialties to blond or dark roast, there is a great variety of coffee to choose from. The Good Life Market is an Agency Liquor Store, offering locally produced upscale wine and beer. The craft beer selection is extensive. As the demand has increased, they have added to their assortment. Since there is not a large selection of specialty beers in the marketplace, The Good Life is a convenient place to purchase them. “Periodically we do wine tastings at special times of the year,” said Linda. People will come to see what they like and then stock up for the holidays or for summer. “We are fortunate we have a lot of customers. Seasonal people are from places where they are used to places like our market. We also have young families and local families,” she said. Family and community best describes the market. 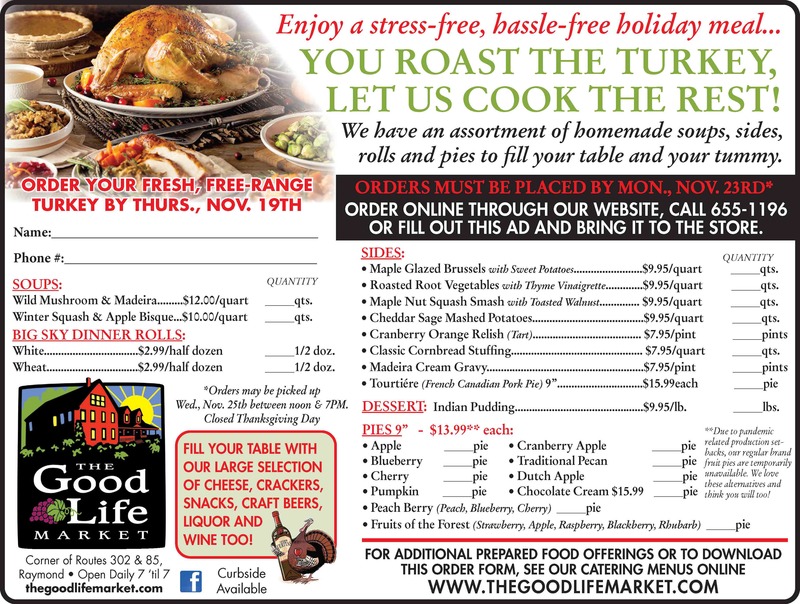 When many Raymond families lost power this fall, The Good Life Market put a post on their Facebook page inviting their customers to bring perishable items down to put in their freezer. “It’s going better than it ever could have. We have increased the employee base and that’s really gratifying,” Linda said. With 40 summer employees and 30 in the off season, The Good Life Market is a major employer in Raymond. The employees serve line crews, landscapers, retired people, and high school kids who stop in for coffee and to hang out on the porch. Mom’s meet up with their friends and eat in the dining room while their children play. Professionals and school employees stop by to bring things home for dinner after work. “Everyone is our customer. Everyone feels really comfortable to come in and find something they enjoy,” Linda said. For the first-timer, she recommends trying a sandwich, coffee or look for a new wine. Then stroll through the market and see what strikes their fancy. Maybe it will be the local popcorn or tea. A local beer or spirit. Try the Beast Feast, a selection of barbeque sauces. Food specials run Monday through Sunday on the website. For more information, visit www.TheGoodLifeMarket.com or find them on Facebook. Order ahead at 207-655-1196. Having a lawyer on retainer might seem like something only the rich would do, but with Key Benefit Solutions, Eric Colby can show everyone how to have a lawyer on retainer, as well as protect them from the theft of a person’s identity and personal data. Key Benefit Solutions works with small businesses and individuals to save money, protect them and maximize mobile marketing. The company also acts as a commercial energy broker. The “foundation to everything is legal and identity theft protection. It’s about what makes you – you, from head to toe,” Colby said. If someone steals an identity, the crook will take the money no matter how much it is and then he’ll sell the personal information he finds, repeatedly. Criminals can commit bad crimes in someone else’s name and it’s the true owner of that name, address, social security number that will be held liable for the crimes. “The most valuable commodity is data. It’s more valuable than anything,” Colby said. When this information is misused, Colby’s legal solution allows clients to speak with someone about not only finding the breech, but stopping it, restoring credit and going to court to prove innocence. “We’ll restore it to where you were. You don’t have to do anything on your end. We have agents who are retired law enforcement as well as professional and licensed people to take care of the issue,” he said. Employees won’t miss work and the questions as to “then what?” is taken care of. Most places only tell someone that information has been compromised, but Key Benefit Solutions can help through the whole process. Legal plans for individuals gives access to 24-hour a day emergency service and local lawyers ready to help you. From landlord issues to trial defense and simple traffic violations, will creation, and reading or writing up contracts, there is a lawyer on hand locally for you only a phone call away. “You’re covered in all 50 states and 4 provinces in Canada,” Colby said. For $20 per month, a person can be covered with a legal solution to any issue that comes up. For an additional $20 per month, clients can have peace of mind when it comes to the safety of their identity. Both fees include your protection along with the protection of your whole family. As a part of the legal solutions package, you download an app on your phone where you can also access their perks program, which gives you access to over 450 different well-known businesses who offer coupons and discounts, essentially making the service free and even paying you depending on how much you take advantage of the perks. “It’s a matter of protecting people. That’s the power of having a level playing field. You want someone in your corner,” said Colby. Key Benefit Solutions and its partners have top notch customer service, guaranteeing how long it takes to get the work you need completed. Colby knows about being poor, homeless and how to work up from the bottom, but as a Coast Guard veteran himself, he always seeks out the best in life. Over the years, Colby has seen a lot of mom and pop businesses with going out of business signs. “I thought there has to be a reason – more than the Walmart or Amazon effect,” he said. “I wanted to find ways to save small businesses money.” He does audits for businesses and families, looking for ways to save them money on their existing expenses. By using Voice over IP (VoIP) and simple phone marketing devices, Colby can help small businesses and independent contractors grow their brands. This is also good for individuals who communicate often with friends or families overseas. It offers a way to communicate more effectively and for less money than traditional phone calls. Most companies don’t use the marketing available to them, Colby said. With beacons that send out a signal 100 yards away, customers can be drawn to a business with specials or sales. “Most people want quick and easy. Home businesses, arts and crafts, they can promote whatever they want,” he said. A device like this is perfect for restaurants or real estate agents who can send a virtual tour right to a phone outside the house. Key Benefit Solutions also offers merchant processing that gives a portion of each swipe to veterans. “We do everything we can to help keep businesses and families going,” he added. 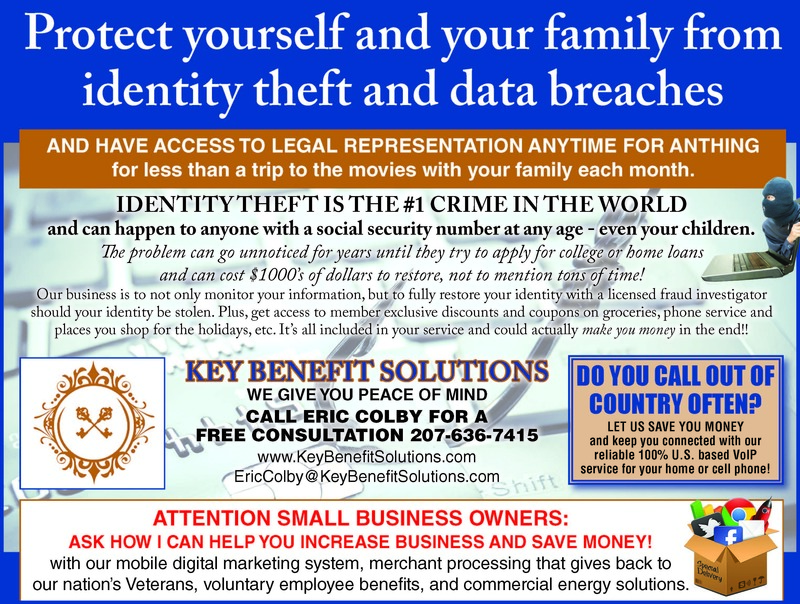 For more information, visit www.keybenefitsolutions.com or call 207-636-7415 or 207-604-4710. Many people consider their pets as family. Leaving a pet home alone while the owner is at work, makes them lonely and sad. The best alternative to a day of napping at home is to take him or her to Jordan Bay Dog Daycare in Raymond, just past the turn-off for Route 85, on the way to Bridgton. Owner Chris Jordan is a certified dog trainer, who has worked with all breeds and temperaments. 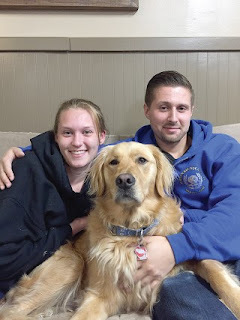 “I worked at a dog daycare and thought we’d start doing it on our own,” said Chris. Jordan Bay Dog Daycare opened a year ago and they have been filling a need in the area ever since. “The need is here. A lot of places can be full,” said Chris’s mother Nancy Jordan, who works in the day care most days. The space is broken up into two indoor rooms and a 4,000-square foot outside play area that is made of astro turf so dogs don’t become dirty and don’t dig. The play area has ramps, tables, tires, obstacles, and plenty of toys to keep them stimulated both mentally and physically. Each night the center is cleaned from top to bottom. “We are always with them,” said Nancy. The staff can give medication if needed and food can be brought in for lunch, but it is not provided. Nancy, Chris and Kayleigh Jordan, who also works at the daycare, are all pet CPR certified. While at daycare, the dogs work on socialization as well as basic commands like sit, stay and wait. “We focus on socialization. It’s a safe environment,” said Chris. There is no minimum age for the dogs, but they must have had all the required vaccines and must be spayed or neutered. Clients bring their dogs from Sebago, Portland and surrounding areas, but mostly from Windham and Raymond. They also have a lot of vacationers drop off their dogs for the day. The daycare accepts dogs on a drop-in basis if the dogs are brought between 6:30 a.m. and 10 a.m. The mornings are busy and bringing in dogs after 10 a.m. can disrupt the balance the dogs have achieved between each other. The dogs that have already arrived are beginning to settle in and the new dog is excited to be there, causing a possible disturbance. On average, the daycare has 18 dogs each day but can house up to 25 dogs per day safely. During the summer months the daycare fills up faster in which case calling ahead to schedule the days you want is never a bad idea. They do not do overnight care. There is a full day price and a half day price. The prices are less than Portland daycares, said Nancy. They also offer a 10 percent Veteran and senior citizen discount. “The dogs go home really tired. Some don’t want to go. We’ve had owners drag some dogs out,” said Kayleigh. The daycare is open Mondays, Tuesdays, Thursdays and Fridays from 6:30 a.m. to 6 p.m. They are not open on weekends. Someone is with the dogs all day and most of the time there are two people with the dogs. Jordan Bay Dog Daycare hopes to offer grooming services soon for their regular clients and possibly others, including baths and nail clipping. Chris also has plans to offer training classes for puppies in January. The daycare expects to be hiring part-time help in the near future. They also are adding cameras, so owners can watch their dogs enjoying themselves at daycare. “We do post a lot of photos and videos on Facebook,” said Chris. 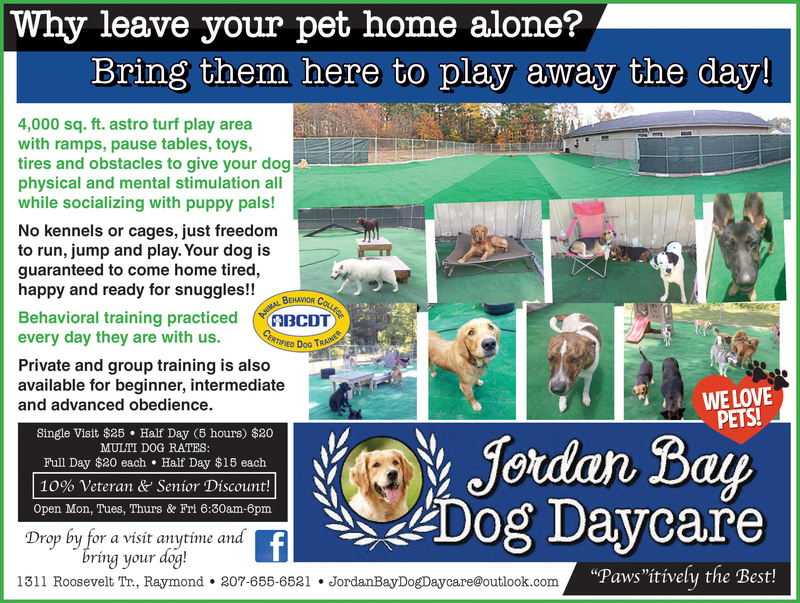 For more information on Jordan Bay Dog Daycare, visit them on Facebook or call 207-655-6520. 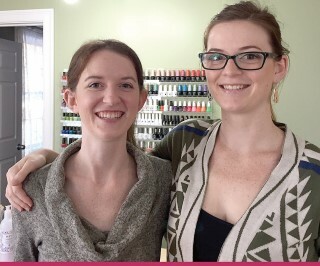 Sisters Ashley and Chrissie Fitzpatrick care about pampering and getting to know their clients at Natural Beauty Day Spa, 1004 River Road in Windham. They opened their door two weeks ago, but will have their grand opening on Friday, November 3. The spa offers nail services, facials, waxing, makeup application and massage. Ashley is the nail technician. She moved from interior decorating, to decorating cakes in a bakery, then to her work as a nail tech. “It was time. I wanted to have more of a relaxed environment,” she said. “It’s calm and comfortable,” added Chrissie, who is a graduate of Capilo’s in Augusta. “You use your hands and feet every day. Most see this as a treat, but it’s keeping them healthy. They get so neglected,” said Ashley about manicures and pedicures. Ashley uses a variety of polishes, but her favorite is Zoya, which is free of 10 different chemicals typically found in nail polish. She offers a variety of nail art designs. There is also a color-changing shellac which changes with the temperature. Clients can partake in a paraffin-alternative hand dip called Eco-fin, that is made of soy, coconut oil and other natural ingredients. Natural Beauty Day Spa does not offer acrylic nails. Nail services are great for men, too. “All guys fight it for a long time, but they really love it,” said Chrissie. For men, it’s more about the massage than the nail care. Each nail treatment comes with a massage, which is great for people who suffer from the pain of repetitive motion. “Ashley is super sanitary. She’s the cleanest nail tech I’ve ever seen,” said Chrissie. She uses tub liners for the pedicures and uses stick on files rather than plastic ones that can’t be sanitized. “I love my clients. I have the best ones,” said Chrissie. Clients have followed them from the surrounding areas. Some are from Windham, Portland Cumberland and even as far away as Biddeford. “Eyebrows, as with nails, you see clients every few weeks. You get to know the whole family and develop a relationship,” said Chrissie. The makeup is for fun. Chrissie can put together a night-on-the-town look or create a special look for a special event like a wedding. “I connect with people really well. I can make them look like themselves only more beautiful,” she said. Facials and massages are held in a private room. Massages are done by Briana Henes and she offers a menu of services including polarity. The sisters chose Windham for their business because it was a good central location. “There’s a lot going on in Windham. It’s my go to town,” Ashley said. Most services are by appointment, but walk ins are welcome from 10 a.m. to 6 p.m. Monday through Friday. 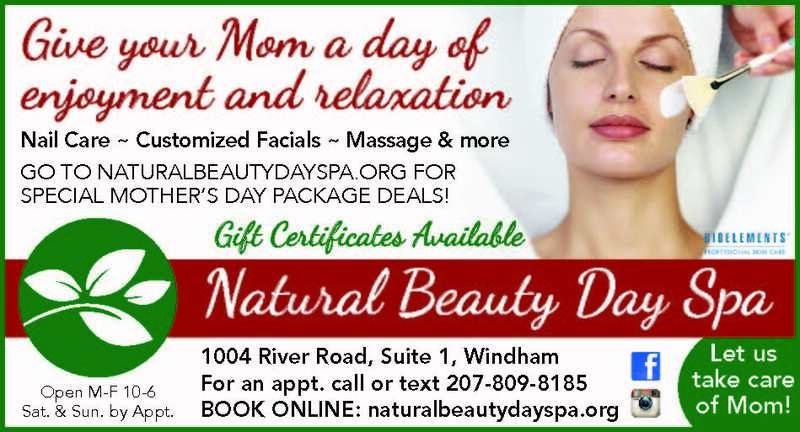 Find more information or request an appointment on Facebook, by phone at 207-809-8185 or at www.naturalbeautydayspa.org. Watch Facebook for special offers. Myths and assumptions can be detrimental to your success in all areas of life – including achieving your financial goals. When it comes to investing, it's vital to separate fact from fiction. Here are three common myths you'll want to erase right from the start. If you’re putting money aside in a low, fixed interest rate savings or money market account, this isn’t investing. This can offer a cushion for emergencies and unexpected spending needs, but it’s only one piece of a financial strategy. Investing is using your money to potentially create more money over a period of time. Some people may shy away from investing, thinking it's too risky. Although investing does come with risks, not investing can also be a risk to your financial future. If your money doesn't grow, you may face the risk of not achieving your long-term goals – like sending a child to college or retiring from your job. The following graph illustrates the potential difference between saving and investing. It shows how the same contributions over the same amount of time can grow to a much larger amount when earning a higher return. Source: Edward Jones. Assumes saving $550 per month rounded to the nearest $5,000. Example is for illustration purposes only and does not reflect the performance of a specific investment. This example shows that the difference between a 3% and 7% return could be nearly $600,000. Investing takes some homework. That’s why many investors seek professional guidance. You should buy and sell often. Being patient can be difficult. But trust us on this: Jumping on the bandwagon of the latest investment fad and selling every time the market drops probably won’t get you to your goals. We believe in quality investments, not fads. We believe a financial strategy should be created for market ups and downs. And when the markets are volatile, Edward Jones can help you put these events into perspective. You’re too young or too old. The sooner, the better – but it's never too late. Obviously, starting early is a good idea, because your money has more time to grow. But it’s really never too late to start investing. In fact, if you’re over age 50, you may be eligible to make catch-up contributions to an Individual Retirement Account or 401(k). And, if you're closer to retirement age, you’ll want a financial strategy to help ensure your money lasts. Lastly, when the time comes, all of us should plan for where our money will go when we’re gone.